It’s hard to find someone who has plenty of time to squeeze in a career, family interaction, and attention to good health or weight loss. Even stay at home moms are swamped with the schedules of their family—not to mention the duties of running a household. If you feel there’s no time to fit in a bit of exercise, you’re wrong. Even the most hectic schedule can afford a few minutes a day, and I’ll show you how! Figure out what your down time is. Although you may want to sit on the couch and veg out for awhile, it’s the perfect opportunity to sneak in a little mindless exercise. Walk on the treadmill or do crunches while tuning into your favorite show. Take the stairs wherever you go – whether it’s at the office or in the shopping mall. Escalators and elevators do nothing to help you lose weight. Park far away from the door. Whenever you go grocery shopping, park far off in the lot. The extra steps you gain will help stave off weight gain. If you clean house or do chores, make it fun and fit! Turn up the radio and dance while you’re dusting. Get into the groove while you’re vacuuming or sweeping the floors and you’ll burn fat while you fight the grime. You can also dance while you’re in the kitchen making dinner, or do toe touches, step ups, or other exercises. Make fitness a family event. If you don’t want to sacrifice your time spent with your spouse and children, just bring them onboard to go for a walk with you in the neighborhood. You’ll have ample time to chat about everyone’s day and feel close for an hour or so. Don’t use work as an excuse. 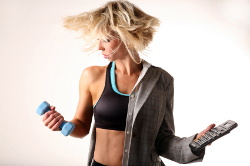 There are plenty of ways to get fit at work. Walk during lunch or whenever you have the opportunity instead of sending an email to a coworker for example. Stretch at your desk or invest in a bicycle pedal that conveniently gets placed under your desk to give your legs the movement they need. Move when you’re talking. If you’re one of those people whose phone is glued to their ears, don’t waste all that time – use the handheld and get moving while you catch up with an old friend! The key is to start small and work toward building more exercise into your day. Even as little as 6 minutes a day can improve your health and help you burn off the calories that you ingest during a day. No more excuses – exercise fits in wherever you allow it!